Remember that straddling bus thing that was going to revolutionize transportation by driving over traffic? And then remember how it seemed like a scam? Well, now it sure looks like it’s dead. 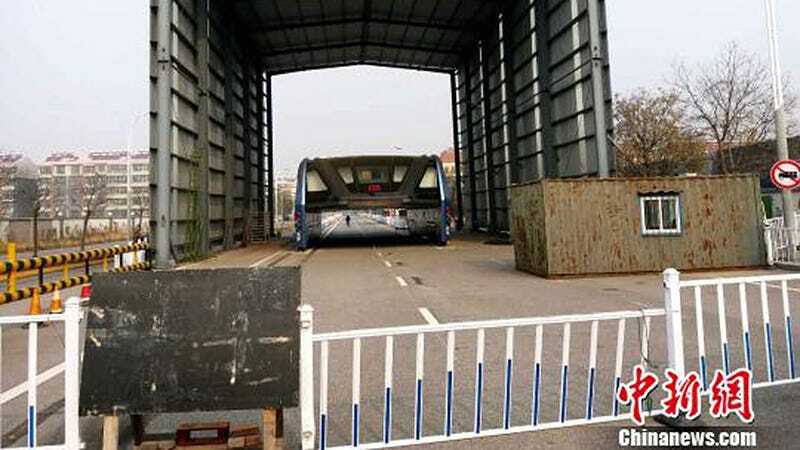 The straddling bus’ unblinking shell is gathering dust on its little stretch of test road in Qinhuangdao, Hebei that it could never escape. It’s just hanging out, looking sad and alone. A local reporter recently checked up on “the future of public transportation” at its testing site in Qinhuangdao, only to find it forgotten in a rusted garage, covered in dust. The bus is currently being looked after by a pair of old security guards who reluctantly admit that they’ve been forgotten about as well. As far as I can tell, this bus has been sitting, rusting since at least August, and things don’t look good for this thing getting raised from the grave. It might have been a flawed concept from the get go, as it was basically a train very close to traffic on rubber wheels that couldn’t turn. But now it looks like we may never know if it was the idea or the execution that was the problem.